Handcrafted African Wood Mask, "In Silence"
With eyes closed, this beautiful visage is covered with ornate aluminum repoussé. It is a traditional mask used in funeral rites by the chief priest of the Yiku clan of Ghana's Volta Region. The ceremony expels the souls of the recently dead. "The almost invisible mouth makes it sacred because of the silence during funerals," designer Evelyn Kafui Ahianyo explains. "Its possession assures protection while averting misfortune." Evelyn Kafui Ahianyo has received 9 microcredit loans with 0% interest from Kiva and Novica, the first for $900 and the most recent for $1000. Proceeds were used to invest in a purchase of wood, metal plates and paints to increase production. Very beautiful details. An interesting object. "My masks are unique because I use my knowledge in design with each one." "My ability to work with masks is inborn, and my greatest inspiration is to preserve our rich cultural heritage. "I'm Evelyn Kafui Ahianyo, born in Accra on September 12, 1965. I have two sisters and a brother. "My masks are unique because I use my knowledge in design with each one. Initially, I wasn't using lots of different materials, but now I use recycled glass and glass beads, aluminum, brass and more. "I sit and draw the mask creatively, and come up with the colors that will make it stand out. I'm also good at observing nature and this comes to bear when I have to sit and come up with designs after the mask has been carved. "Although my masks have cultural references, I try to enhance the looks. 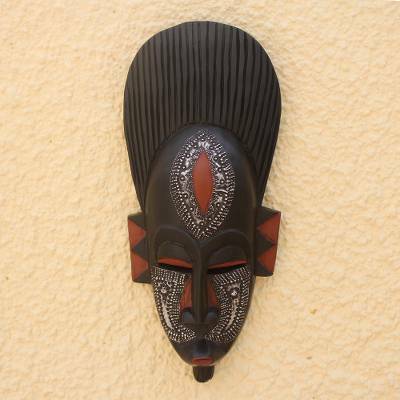 In Ghana, mask are seen to have spiritual beliefs attached to them, so most people wouldn't like to even hold them. But with the new coloring and designs, people are now comfortable with masks and are ready to learn more about the history associated with them." The 4 masks purchased (Courage, In silence, Supremacy, Marry me, ) were exactly what I was expecting in quality and beauty. Thank you! So beautiful, love the details. Very nice, thank you so much. The 2 sculptures I ordered (""A Mother's Bond"" & ""Detugbi"" arrived today and they are wonderful. They are beautifully made and look even better in reality than on the website. I'm absolutely delighted. Thank you.